The 94% yes vote is a strong indication that photo pair 2 is the same young woman. The 65% no vote for the boy and young man in photo pair 3 is much less certain. The blog post was promoted on twitter, Google+ and, to a lesser extent, Facebook. I disabled comments on the blog post and Google+, and only 2 people commented on Twitter. So I think the responses probably were not influenced by comments. 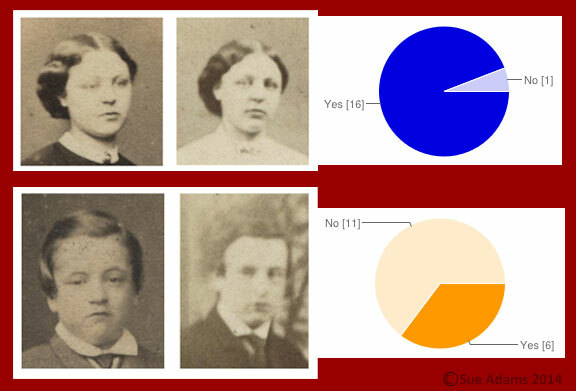 Compared to the 51 votes lodged for face pair 1 in Photograph Identity Question, 17 is a little disappointing, but may be due to less traffic to the blog. The responses in both cases dropped off within a couple of days of publication. Did asking one more question, or the appearance of the blog post affect the response rate? Had the novelty worn off and is the audience bored with the same question about different photo pairs? As I have some more face comparisons to present, I would really like some insights on boosting the response rate. Please comment! I don’t find your facial identity test boring at all – quite the contrary. It takes a bit of brain teasing to come up with an answer and I really like participating. I receive notification of your blog by email, and it was only 2 days ago that it landed in my inbox – so maybe it’s taking sometime for those type of followers to be notified. I don’t have a WordPress account, so cannot comment directly on your blog.